A busy night under lights at Cranbourne on Friday where we have three runners. Zume Forward, Louisville Lip and Real Gent are all at the races with Zume Forward the first to go in race four, the Fillies and Mares Maiden Plate over 1600m where she will be ridden by Jason Benbow. Zume Forward was beaten narrowly over 1400m at Cranbourne over 1400m at her last start and Mike Moroney is keen to use a left-handed whip rider. “She just wanted to run about a wee bit last time and Jason can use the whip in either hand,” Moroney said. I’m very happy with the way she has trained on, it’s just a pity about the barrier which makes things tricky. “She normally begins well so I’d say we’ll go forward and I think the trip will suit her. Louisville Lip (pictured) is in race five, the Benchmark 64 Handicap over 2060m with Harry Grace claiming and jumping from barrier nine in a field of 11. The four-year-old son of Ocean Park finished eighth last start at Sandown over 1800m on January 2. “He too has drawn poorly but looking at the race there does not appear a huge amount of speed in it,” Moroney said. “He looks terrific and is particularly fit so I’d like to go forward on him if we can. Real Gent runs in race seven, the Benchmark 64 Handicap over 1500m with Jordan Childs to ride from barrier five. The import last raced on December 30 when he resumed at Seymour over 1200m. 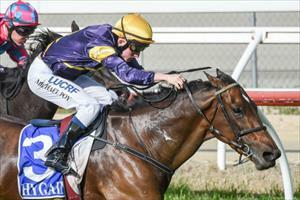 “I have to say was disappointed with him first-up, I expected him to run better then he did,” Moroney said. “His work since has been good and I can’t fault him so I’m looking at the step up in trip to improve him.